Back in November I told you how easy it was to make your own homemade marshmallows. They taste a thousand times better than the horridness you by in a bag. 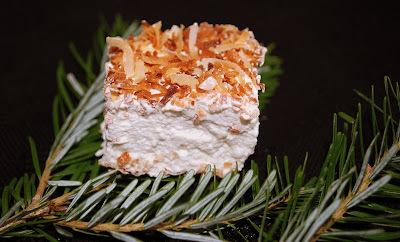 Yesterday I made toasted coconut marshmallows. Something that is becoming a holiday tradition with me. The toasted coconut is just heaven. The crunchy topping (and bottom) really makes these fabulous. I like the plain ones (mostly in hot chocolate) but the toasted coconut ones I could eat by the handful. Just follow the recipe for the original marshmallows. Toast a 7 ounces bag of coconut in a large saute pan on low heat, stirring frequently. Don't walk away from the pan for too long. Coconut can turn from brown to black very quickly. Once the coconut it done, let it cool in the pan while you make the marshmallow mixture. Dust a 9x13 non metal pan with confectioners sugar. Place 1/2 the coconut in the bottom of the pan then pour the batter on top. Cover the top with the other half of the coconut and let it sit, uncovered overnight. This batter was much easier to get out of the pan than the plain version. I took a hot knife and scored around the pan and they fell right out. 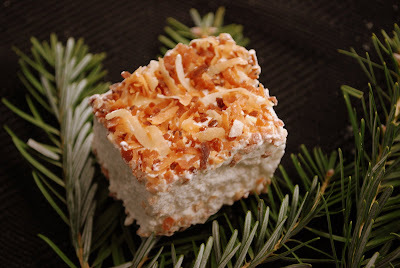 Cut into squares, roll edges in confectioners sugar and enjoy! With your pics I can imagine these on my tree! How wonderful i bet they are. I plan on making marshmallows tomorrow, I'm so excdited about it, I've never done it before!